Campbell Crew: Is That Spatula Orange? Hmmm...I Like Orange. 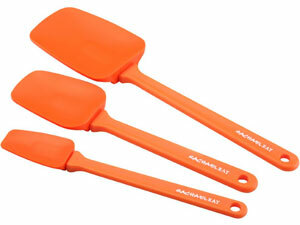 Is That Spatula Orange? Hmmm...I Like Orange. I knew people that enjoyed it. I read magazines of those that were adorned with honors regarding how well they cooked. I even read blogs that would feature various styles of cooking. And I tried quite a few new recipes. We even enjoyed some of the meals. But I still didn't like cooking. I was searching for anything that would make this necessary task more bearable. Crock-pot meals, freezer cooking, casseroles...they all kind of worked in the short term but then I would get bored and not feel like doing that anymore. But my family still needed to eat. Now I'm not a person that watches a lot of TV during the day. Sure, I'm a stay-at-home mom but I don't have time to sit and waste time. At least that's how I see it. The laundry, cleaning, volunteering, and other responsibilities keep me going all day. Oh yes...and I didn't even talk about the subject at hand...cooking. And if I want to sit and relax, I'd rather chat with friends or catch up on a few of the blogs I've subscribed to or read a book. But there was this day that I was just spent. It was 2:45 and I knew I would be getting the boys from the bus stop in about 45 minutes. So I decided to sit and flip through the channels to see what might be on. Lo and behold I came across The Rachael Ray Show. It was in the last segment of the show where Rachael was cooking. I don't know what held my attention. Maybe it was the brightly colored pots and gadgets that drew me in. Maybe it was her everyone-can-do-this delivery as she whisked and browned and measured and poured. Anyway, in that 15 minutes I decided that I liked this down-to-earth lady and considered tuning in again. You know what? I did. At about 2:40-2:45 for a few days here and there, in the weeks that followed, I would take a break until 3:00 with a cup of coffee in hand and check out what Rachael was making for dinner that night. She had certainly caught my attention. I just had no idea (yet) what an impact she was going to have on me and my family. Wife. Momma. Daughter. Sister. Friend. Teacher. Jesus Follower. Co-President of our Crew and all the duties that keep our lives balanced each and every day.